Oppo K1 Announced in China with In-Screen Fingerprint Reader and Snapdragon 660 - Playfuldroid! 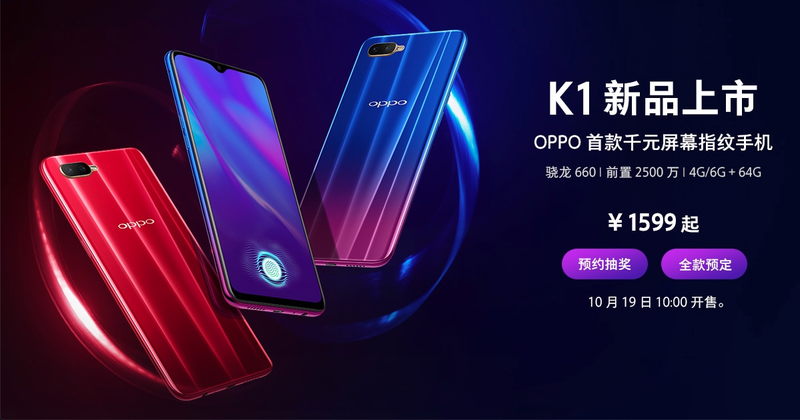 Today, Oppo has launched its first K-series smartphone called the Oppo K1. The USP of the smartphone is that it features an in-display fingerprint and carries an affordable price tag. The Oppo K1 features a waterdrop notch screen like the recently released Oppo F9 and Oppo R17 smartphones. Its 6.3-inch AMOLED screen produces FHD+ resolution and the small notch allows it to deliver an aspect ratio of 19.5:9. The Snapdragon 660 is the driving force of the smartphone and it includes a decent battery of 3,500mAh capacity. For photography, the Oppo K1 features a selfie shooter of 25-megapixel. The backside of the phone features 16-megapixel + 2-megapixel dual camera setup. The cameras of the Oppo K1 are equipped with AI features for better photography experience. The 64 GB storage + 4 GB RAM and 64 GB storage + 6 GB RAM editions of the Oppo K1 respectively cost 1,599 Yuan ($231) and 1,999 Yuan ($299). Its pre-orders have started in the home market with official sales slated to kick off from Oct. 19. It can be bought in two color gradient choices such as Van Gogh Blue and Mocha Red. The Chinese manufacturer did not confirm anything on the international availability of the Oppo K1.